The NuPower™ 12D05A is a small, highly efficient, connectorized solid state power amplifier that delivers up to 35 watts of RF power from 1700 to 2400 MHz to extend the operational range of data links and transmitters. The NuPower 12D05A accepts a nominal 0 dBm (1 mW) RF input and provides 44 dB of gain from 1700 MHz to 2400 MHz for continuous wave (CW) and near-constant-envelope waveforms. Based on the latest gallium nitride (GaN) technology, the NuPower 12D05A’s 40% power efficiency and <10 in3 form factor make it ideal for size, weight, and power-constrained broadband RF telemetry, tactical communication systems, and electronic warfare systems. NuPower PAs feature over-voltage and protection and can operate over a wide temperature range of -40 °C to +85 °C (baseplate). 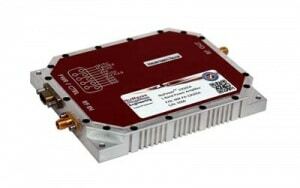 Extend your operational communication range with NuPower ™ amplifiers from NuWaves Engineering.